I've created this recipe to be super simple, sometimes I just can't be bothered to weigh things out, especially mid week and when I'm already making more than one meal. I honestly think that our US friends have the best idea ever in using cups and not weights, I wish that the UK would adopt this method more! it's such an easier way of cooking, anyway I'll step off my soapbox now and get on with the recipe! 1. Cook the pasta according to the instructions. 2. In a saucepan bring 2 cups of water to the boil with the stock cube, add the peas and boil for 10 minutes. 3. 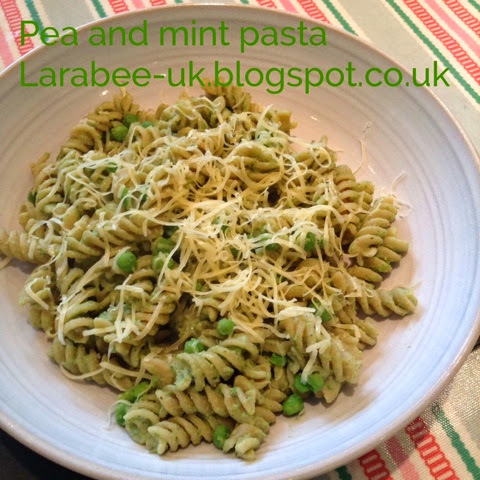 Drain the pasta, drain the peas but retain some if the stock. Set 1 tbsp peas aside and using a small hand blender, blend the remaining peas with 2 tbsp stock, mint and the ricotta, add more stock if you want a runnier sauce. 4. Stir sauce through the cooked pasta and top with a little Parmesan and black pepper.